what makes me smile? 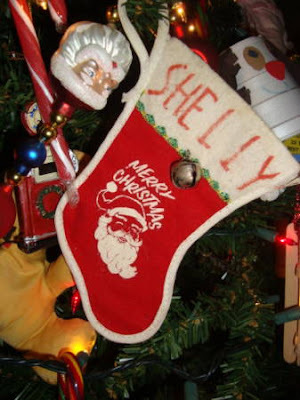 when i open that christmas decoration box that holds this little stocking. it was given to me when i was about 2 or 3 years old. ummmmm yeah, so that's 42 years ago.... it was given to me by a local gas station attendant .... back in the days when you actually had someone pump your gas and squigeee-wash your car windows. and the time when nobody used seat belts and kids used to just bop around in the back seat! and... i must confess.... i used to hang upside down in the back seat, my waist-length blond hair dangling... my head where your feet go... and my feet in the backseat window... and i used to put on puppet shows with my feet... to entertain the cars behind us! I used to love riding in the station wagon with the rear-facing back seat!